Note the severe hole misalignment. 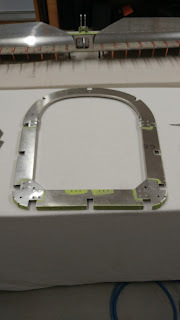 After much discussions with the factory, it turns out there was ANOTHER manufacturing problem, and the skin is bad. I will be getting a new one! I have now assembled the remaining ribs 3 and 2! The plans were wrong, but at least the parts all fir together nicely this time. And here is rib 2 finished ... forgot to take some pictures of the process. This one is special in that the top faces one way, and the bottom another. 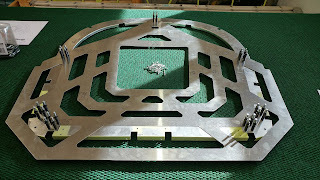 As such the jig is also on one side, and then another, instead of being all on one side. Hard to explain without pictures! 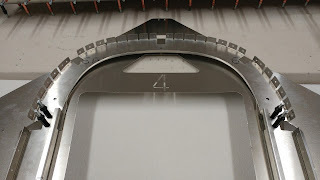 The top of the rib didn't line up with the jig for me ... but according to the plans those top holes are maybe not supposed to? Everything else line sup perfectly so for now I'll just move on. The shelf support pieces are missing here, though I did add them later! 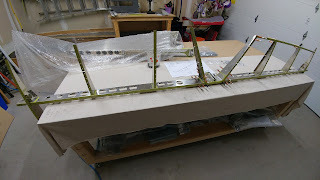 As I was exchanging e-mails with the factory regarding the ribs, I decided to get the workshop ready for the full fuselage build, which is of course a pretty big piece of kit ... after the ribs, we pull out one of the long skins and really start building the tail, so now is the time to do this. Which means every. single. rib. had a problem! 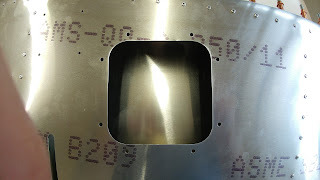 And I did all the metal prep work! 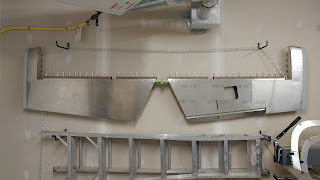 The parts for these two ribs are "drying" as I type this! The "frame" of Rib 4 is completed! I expect a bit of fluting along that same inside flange should fix this ... I'll give that a try next. Rib 5 DONE. On to Rib 4! 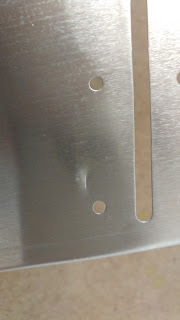 Those flanges that gave me a hard time on Rib 5 are much better on this part, though it's still a slightly tighter fit than it should be, we'll see what I end doing about it when it comes time to rivet. 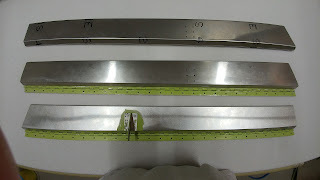 Rib 5 is the first rib we assemble that requires alignment using a provided jig. I just used a seamer to bend the flange out of the way. Easy. Got the factory to look at it, and got the OK, so I can move on! 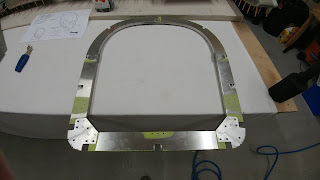 The first step to building the fuselage is putting together the rear rib assembly. 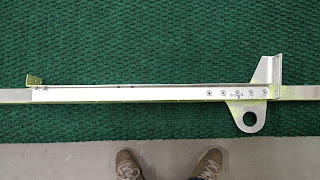 This is the structural component that goes in the tail of the aircraft and to which the empennage attaches. The manual calls for AN3 bolts in this location, but did not specify the length ... -4A looked like they would be a tight fit possibly too short, based on the idea that at least 2 threads should stick out past the nut. So I used -5A's ... I've got about 3-4 threads showing, so that's good. I may find myself short some -5A's later, but they're cheap and easy to get! 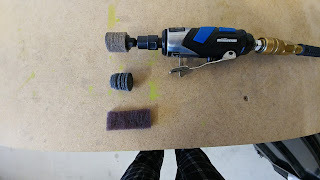 OK, so I got the correct trim tab, and guess what? It had some damage! But, I managed to fix it, and get it installed. So finally the end of that ordeal. And I can now call the elevator finally done (for now)! Woohoo! More Trim Tab Woes & Elevator Progress! That new, shiny, perfectly straight trim tab? The top 2 are my previous, old and busted ones, notice the shape and angle on the right, and the location of the holes for the control horn. The bottom one is reversed! So I guess I'll go ahead and get a *4th* one. Getting the skin on just right was a bit of a challenge, but I'm quite happy with the result. I gotta say, placing it vertically sure helped: stand at the end, look down the edge, look at the ribs, etc. and adjust as needed. 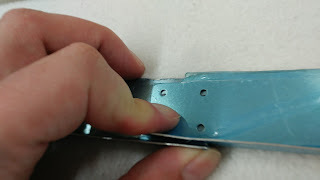 Doing this laying flat on a table would've been far more painful, having it to flip it over constantly (That trim tab is an old dented one, but for the purposes of fitting everything it works fine, it's not yet one permanently). I re-started my elevator as I had botched the first one (entirely my fault). After talking with the factory, I had a try at buffing out the damage. I'm not going to detail every single spot that had issues (in the end I found 7 skins with scratches/dents), but it turns out this is real easy to do! Luckily most of the damage is on the inside of fuselage skins, or on inside skins, so no matter what, the work will never be seen. 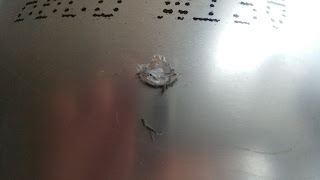 I still wanted to smooth everything out to make sure that there's no chance of any scratch/dent becoming a crack. First, no longerons! Apparently the kit is made up of TWO crates (Or more precisely one create and one tube) and Jean forgot to send me the tube!! Doh! How does that happen?